Lakeland Dairies has reported strong financial results for the year ended 31st December 2017, with group annual revenues increasing by 33% to £683m, up from £514.6m in 2016. This yielded an operating profit of £14.9m, compared to £6.2m in 2016. Profit before tax was £14.1m in 2017 and the co-operative closed the year with a 19.5% increase in shareholders’ funds at £104.3m, up from £87.3m the prior year. Lakeland Dairies' Global Logistics Centre and Dairy Processing Facility at Newtownards. Earnings before interest, depreciation, tax and amortisation (EBIDTA) were £28.9m, increasing significantly from £16.2m in 2016. Milk volumes processed in 2017 increased to over 1.2 bn litres, reflecting ongoing expansion among Lakeland Dairies’ 2,500 milk producers and a full year of milk supply from Fane Valley dairy farmers (following from the acquisition of Fane Valley Dairies in May 2016). The co-operative has also retained and fully maintained its milk powder and butter facility at Banbridge, Co. Down, which provides continuing flexibility and opportunities in relation to any potential Brexit outcomes. Lakeland Dairies has a technologically advanced Global Logistics Centre and major dairy processing site at Newtownards, Co. Down. The efficiencies being achieved through all operations enabled the removal of milk collection charges (cartage), with an overall reduction of costs of £4.4 million to milk suppliers annually. Farmer owned Lakeland Dairies operates across 15 counties on a cross border basis, processing milk into a wide range of value-added dairy foodservice products and food ingredients. Lakeland has a portfolio of 240 different dairy products which it exports to 80 countries worldwide. Lakeland Dairies’ Food Ingredients revenues increased by 37% to £415.5m in 2017. This performance was driven by strong business development activity and a resurgent demand from food manufacturers for high quality, functional dairy ingredients combined with favourable market conditions. The Bailieboro Dryer No. 3 development was officially opened in 2017 with additional upgrades to R&D, milk intake, storage and separation facilities at the site. Overall, the Bailieboro site produced record volumes of over 200,000 tonnes of milk powders and butter products for worldwide export during the year. Revenues at the Lakeland Foodservice Division increased by 28% to £212.7m in 2017. The major Lakeland processing centres at Newtownards and Killeshandra continue to increase output year on year, producing record volumes of butter products, ice cream, cream and cream blends. 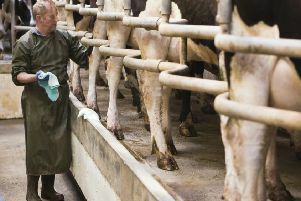 The long standing reputation of Lakeland Dairies’ products for quality, taste, functionality and reliability underpinned the confidence being demonstrated by customers in key markets such as the UK, Middle-East, Europe, Asia and China. These markets performed well against a backdrop of volatile commodity input costs, the need to increase selling costs and intense competition. Agribusiness revenues increased by 20% to £54.7m in 2017. This increase was driven by record sales of over 200,000 tonnes of high quality feed and 25,000 tonnes of fertiliser. Reflecting an overall improvement in dairy market conditions, and unfavourable weather, many farmers provided supplementary feeding in addition to grazing to boost milk output by their herds. During the year, Lakeland launched a new Dairy Development Programme for the co-operative’s milk suppliers in Northern Ireland. The programme is aimed at maximising efficiency and profitability on a sustainable basis for the future. 2017 also saw the commencement of an upgrade programme at the co-operative’s Lough Egish Feed Mill. This will include new technology and an expansion in manufacturing capacity to meet future operational and performance needs. Michael Hanley, Group Chief Executive, said: “In 2017, Lakeland Dairies achieved performance improvements across all divisions of the business. Trading conditions were helped by a reduction in global milk supplies and product availability. We were able to take advantage of these conditions through our efficient processing capabilities and worldwide market presence, achieving satisfactory results. “Our global growth has been driven by our strategy, investments, product range and the high quality output of our milk producers. While there are challenges in the global market, it is our intention to continue to drive competitiveness and overall growth, targeting opportunities across infant formulas, dairy proteins and health-related nutritional products. Alo Duffy, Chairman of Lakeland Dairies said: “Lakeland Dairies is growing and well positioned for future developments that will benefit our milk producers. Supplier research undertaken in 2017 indicates that our milk producers will continue to expand output over the next five years. We also welcomed 30 new entrants to milk production during 2017 (totalling 200 new entrants since 2013). This continued growth has been driven by strategically guided programmes and initiatives that have yielded efficiencies across our operations, increased volumes and enhanced the overall quality of our offering. “We are most grateful to our milk producers throughout Northern Ireland for their support and the very high quality of milk that they send to us for processing.